I was hanging out at a ferry port in Singapore and saw a ticket booth for Batam, Indonesia. What’s Batam? Never heard of it, so I decided to go there to find out. Published on December 20, 2014 by Wade Shepard Follow me on Twitter here. I walked up to the ferry port’s ticket office and asked for a ticket to Batam. “Where do you want to go in Batam?” the lady asked. Her question was standard, I should have had an answer, but I didn’t. I just stood there looking dumb. I had to tell the truth. I didn’t even know Batam existed prior to a week before I was standing in the ferry port. I looked at a map and was surprised to see how close the Riau Archipelago of Indonesia. What is that place? There was a free trade zone there. There was a city there. It was some place called Batam. I got curious. Batam and the surrounding Riau Islands are a part of the Indonesia-Singapore-Malaysia Growth Triangle, an economic arrangement to partner the development, infrastructure, and talent of Singapore with the resources of the Johor region of Malaysia and the nearby islands of Indonesia. It’s an ideal mix of the globalization era: partnering advanced places with developing ones to scale the advantages of both. After purchasing my ferry ticket I asked around Singapore about the place. There seemed to be three things to do there: shop, gamble, and hire prostitutes. The ferry itself was modern and fast. I rode on the roof and traveled across the Strait of Malacca, the busiest in the world. 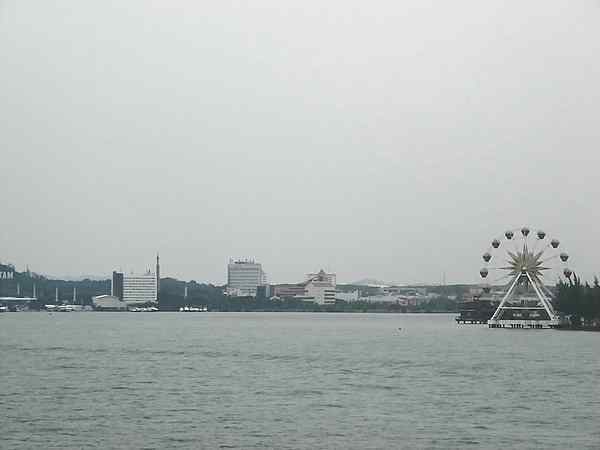 Large freighters and tankers surrounded us, and when we popped through the other side of the traffic the island of Batam arose from the sea. This is what happened when I went there.